Samsung gives Apple a Love Bite! Over the past eight years the South Korean giant has gone from being a virtual unknown on the high street to one that’s on the cusp of becoming Britain’s ‘most loved brand’ and has come up with a brand marketing platform that’s as good as anything its rival Apple could’ve dreamt up. ‘Launching People’ is an advertising funded programme (AFP) series to be broadcast in Spring 2014 where stars from film, music, photography and cooking mentor promising new talent on the back of a nationwide competition. It’s a neat way for Samsung to humanise its brand rather than constantly rely on technological innovation to get people talking as the product gap between itself and rival Apple has all but evaporated. In a string of endorsement deals, Samsung has enlisted the services of Mandela biopic actor Idris Elba; singer/songwriter Paloma Faith; celebrity snapper Rankin and Sunday Times chef Gizzi Erskine to front the campaign in the UK that also includes product placement of Samsung tablets, phones and cameras. Entrants to the competition need to create a two-minute video ‘pitch’ about their chosen idea and upload it to the Launching People website by 6 March 2014. A multi-platform marketing campaign wraps around the TV series and by all accounts Samsung is onto a winner. 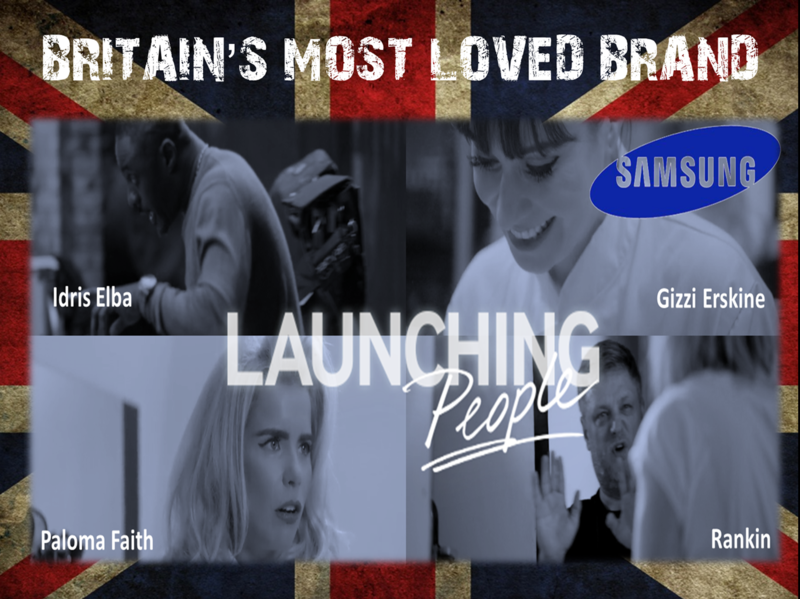 The ‘Launching People’ campaign was first trialled in France last year and has since expanded to other regions across Europe, Latin America and the Middle East, with Samsung using the concept to demonstrate how its technology can help people realise their potential – stealing the message that Apple has so diligently been pushing for the past two decades. “We’re hugely ambitious and it’s not just about being number one in the sector. It’s about how the sector can be redefined and reinvented so you we can stay ahead of the game. We’re here to help people improve themselves and do a little bit more than they could normally do. “Launching People is an exciting competition and it’s great for our brand because our products become the facilitator rather than just the name at the end,” he says. This marks a change in brand marketing strategy for Samsung in the UK that traditionally has focused on technological innovation and design to beat Apple at its own game. Creating a narrative around the brand that’s relevant to the lives of ordinary people threatens to displace the power of Apple as a pre-eminent emotional brand in this space. Last year, Samsung shipped a record 32m smartphones – the largest ever of a single vendor in one year – according to research by Strategy Analytics. At the same time, Samsung increased its global market share to 32.3% which is more than twice that of Apple in the same period. While it is difficult to quantify ‘consumer love’ for the brand, YouGov BrandIndex measures ‘Buzz’ – a balance of the positive and negative things consumers have heard about the brand over the past two weeks. In the 2013 Annual rankings, Samsung came top of the Mobile Telephones/PDA sector with a Buzz score of 20.0, above Apple iPad with 10.6 and Apple iPhone with 10.1. That’s one of the reasons behind Samsung’s bizarre take on football, the global ‘Galaxy 11’ campaign that’s recruited a team of football stars under the watch of the legendary German manager Franz Beckenbauer that includes Leo Messi and Wayne Rooney to play a match to save the world from the threat of an alien invasion. The full story of ‘Galaxy 11’ will be revealed in a series of chapters over the coming months online and across Samsung’s social media channels – including Facebook, Tumblr, Twitter, YouTube and ChatON – using the call to action #Galaxy11. Samsung has been a sponsor of some of the world’s most valuable football properties since 2005 including Chelsea FC, Real Madrid, Bayern Munch, Juventus, Brazilian National Football, the Korea Football Association and The Asian Football Confederation. One comment to Samsung gives Apple a Love Bite! Very interesting to see how Samsung has developed in the past 20 years or so. There was a time when it lagged the likes of Sony, Panasonic, Hitachi, JVC etc. Then along came Apple with its iPods, iPads and iPhones. To come from virtually nowhere to overtake all of these brands took a rare combination of both great technological development, but also very good branding – the two have to go hand-in-hand. Creating awareness and familiarity was a key first step, but that alone was not enough – people have been aware of Philips, for example, for decades – but it has fallen well behind in the consumer electronics stakes. Samsung aimed big and took sponsorship of the IOC and e.g. Chelsea to work alongside its advertising strategy and it has paid off. Given the $ billions at stake for these brands nowadays, sponsorship rights fees are relatively low cost. At present Apple hasn’t really done sponsorship and I am not saying it is the answer to their predicament – it will, however, be interesting to see how they respond – these are two brands at the top of their game and when two companies produce products that are pretty much equal in price, performance and quality – the winner is the one who gets their marketing right.